Bon Bini (warm welcome) to Curacao, largest in both size and population of the ABC islands of the Dutch Caribbean. Curacao boasts an amazing array of colorful Dutch architecture that blends well with the natural beauty of the dry, rugged island. The floating market where locals gather to buy their fresh fruit and vegetables is a work of art in itself. Oddly enough, this line of floating produce platforms is only a short walk from stores such as Benetton, Diesel and Lacoste Boutique. Curacao has done such an admirable job of blending traditional with new, the transition is barely noticeable as you walk through Willemstad’s different shopping districts. But since the Maasdam is docked on the Otrobanda side, my first stop is there, at the relatively new Renaissance Mall located inside Rif Fort. 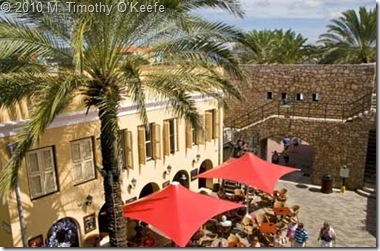 The large oblong open area within the Fort’s walls is lined with a mini-mall consisting of open air cafes, business offices, coffee bars, restaurants, boutiques and upscale shoe stores such as Birkenstock. The shade trees and table umbrellas provide a unique ambiance that reflects island life. It’s also home to the recently built Renaissance Curacao Resort & Casino. Leaving the Renaissance Mall, I pass a group of local vendors selling paintings, clothing, bags, hats and the usual array of touristy artifacts. 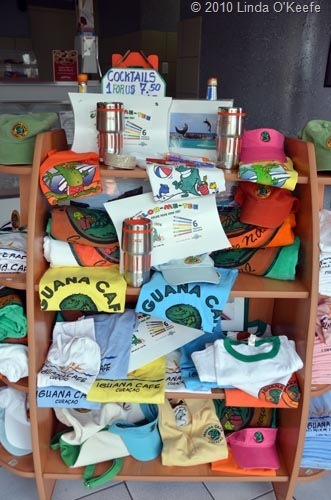 Unlike other islands, there is no harassment or pressure from any of the locals wanting to make a sale. Not a single “Hey lady, come take a look—it cost you nothing!” What a pleasant surprise. Later, back on board the Maasdam, I will overhear several people discussing the gifts they found at this group of vendors and how pleased they were with the variety of merchandise and the prices. I still have yet to explore the Punda side, so I walk the Queen Emma Bridge connecting Otrobanda to Punda. I come to love this bridge because of the way the whole thing is able to swing away on huge hinges and go from perpendicular to paralleling the Otrobanda shore. Warning blasts warn when the bridge will close and guard rails come down to stop pedestrians whenever the bridge opens to allow freighters through. Yet a few hapless tourists (cruise passengers?) seem to get stuck on it. I can’t help laughing when I see them impatiently waiting to get off. Looking to find stores that carry more than the usual same old tourist fare, I turn to the left after reaching the Punda side. As I walk the busy waterfront street, dodging traffic and steady streams of pedestrians, I see Maravia, a jewelry and sculpture shop. Unfortunately it is not open but peering through the window I can see beautiful works of turquoise and bronze. According to a sales clerk in one of the other stores, Maravia customizes all her artwork, both jewelry and sculpture, and everything is handmade. Walking into Little Gifts, I expect to see displays of mugs, t-shirts, shot glasses and the like. Am I wrong! Instead, there are racks of washed soft white cotton eyelet dresses, skirts, blouses, tanks, capris and shorts. The material is 100% cotton so it will shrink some, admits the clerk, but everything is no iron. Little Gifts also carries children’s sizes as well. The price of every piece of clothing I ask about is $39, with kid’s prices half that. A truly perfect store for a little gift. Down the block, I walk into Ackermans, a fabric store with bolts of cloth hanging from the ceiling to the floor. Bright colors, stripes, plaids, and brocades–you name it, Ackermans probably has it. But you’ll be interested in the merchandise only if you can sew. 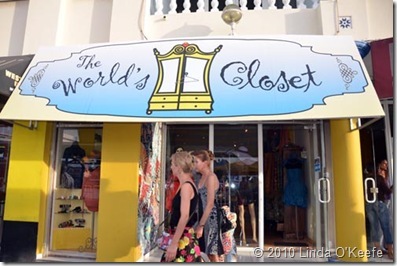 With my sewing abilities ranging between little and none, I next visit The World’s Closet, a small boutique with some the most unusual jewelry I’ve seen so far in the Caribbean: Bracelets, necklaces and earrings, all reasonably priced between $5 and $150 for designs I have not seen anywhere else. 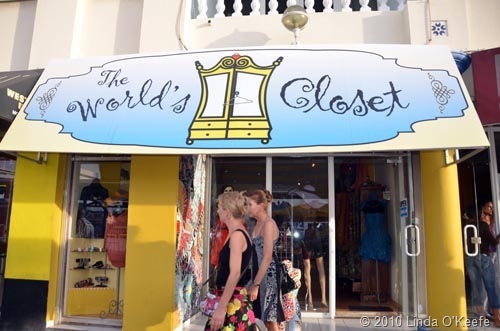 The World’s Closet clothing is more typical of an upscale department store in the U.S. in terms of variety, quality and prices. 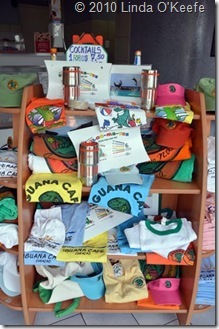 Iguana Too is a small store combining the usual touristy fare of t-shirts and hats but also an ice cream bar. Although the one-price $16.96 t-shirts are of higher quality than usual, at this point I am so hot and tired I would buy a big bowl of ice cream, pay the t-shirt price and find it reasonable. 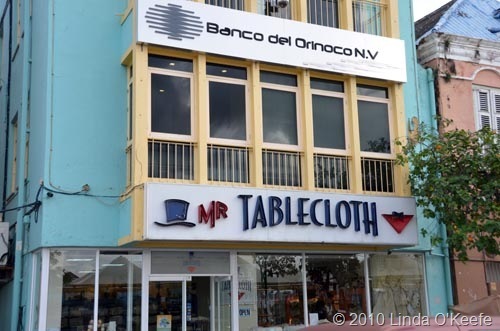 Trying to watch the tummy, I bypass the ice cream and head over to Mr. Tablecloth where Battenberg tablecloths, runners, placemats and napkins abound. I feel like I have been transported to tablecloth heaven: every size, shape and style, along with Christmas décor. 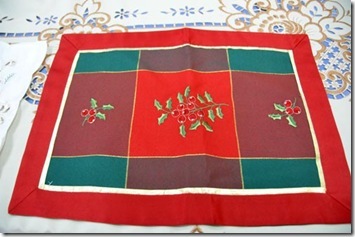 A 14 x 20 table runner is $28, regular placemats are $6.50 and Christmas placemats go for $9.50. 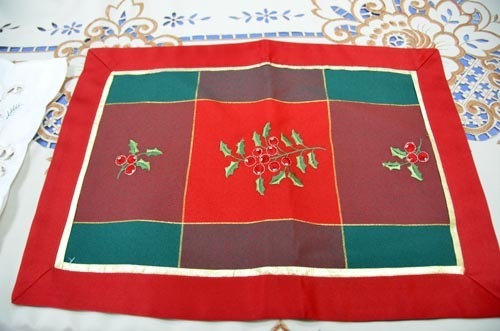 A beautiful silk placemat with rose colored sequins can be yours for $35. Pillow casings and cushion covers are also available at Mr. Tablecloth. A few doors down are several Jewelry stores. Freeport Jewelers and Gifts carries the complete line of Tag Heuer sports watches as well as Italian gold designs by master John Hardy. Also in stock are Hublot Big Bang watches and diamonds by Hearts on Fires that claims to use the world’s most perfectly cut precious stones. Freeport Jewelry also carries more upscale jewelry and watches along with crystal and porcelain. The prices are not outrageous and I see some items on sale. As I head back to the ship, the sun is setting but I notice Queen Emma Bridge is not open. So I take a ferry instead. It drops me off close enough to the Maasdam for a leisurely stroll back to my stateroom. Exhausted, I desperately need a shower after another day of window shopping. Nothing of interest yet we can’t usually buy at home, or almost every other port. I thought I had enabled a way for people to sign up for the feed but it didn’t “take.” Will contact you when it’s working. Thanks! We do try to research a place as well give our own reactions.